Delaware’s 7th microbrewery located in The Historic Town of Smyrna. Brewing extra special beer offerings! Now open! Cheers! The founder of our brewery Ronnie “Blue” Earl Price is a man of simple tastes, always on the hunt for great music, gourmet food, and exceptional craft beer. The simplicity of the blues had always drawn him in, the soulfulness, the earthiness of the style made him feel good inside. Barbecue is to food as blues is to music he would always say, nothing fast about the blues or barbecue, too fast with the blues and you lose the feeling, too fast with barbecue and, well, it just ain’t no good. Finding a good beer had always been a challenge. American beers had lost all their former goodness with mass production and mass marketing. They had lost the feeling. He decided that if it couldn’t be bought, he would have to brew it himself. And so he did. For many years he tweaked his recipes and shared his brews with family and friends. Winning awards and praise among his friends and the home brewing community, his passion for brewing became an obsession, and that obsession turned into the desire to bring these wonderful libations to the public. 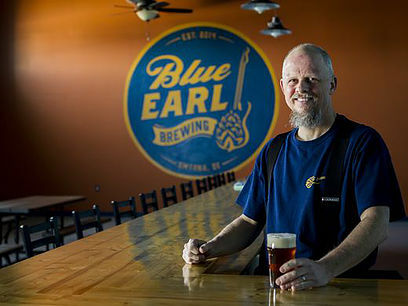 It wasn’t easy getting started, but one by one the barriers have been brought down and we are now very proud to offer you, our friends and loyal fans, Blue Earl beers! Blue Earl produces Hoppy American Ales, Belgian Specialties, German Ales & Lagers, and an ever changing variety of seasonal offerings. Crafting Brew For Your Soul…one batch at a time!